Maybe it was the brilliant sunshine that bathed me daily in warmth, the perfect antidote to gray and raw days of autumn back home in New England. Or perhaps it was the steady diet of authentic and affordable Mexican fare in adobe-style restaurants that resembled a grandmother’s living room. Or it could be the chance to hike with few others in the 9,000-foot peaks of the Organ Mountains and the sandswept landscape of White Sands, two national monuments in the region. Whatever the reason, after 3 days in Las Cruces, I found myself looking at Airbnb and VRBO, dreaming of renting a place during the dog days of winter in March. Less than an hour north of El Paso, Las Cruces is best known as home to the 25,000-plus students at New Mexico State University. 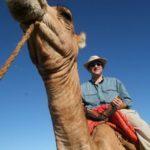 The city doesn’t get a lot of press probably because it resides in the same state as the far trendier Santa Fe and Taos (even more reason to visit now before the California crowds start to arrive). 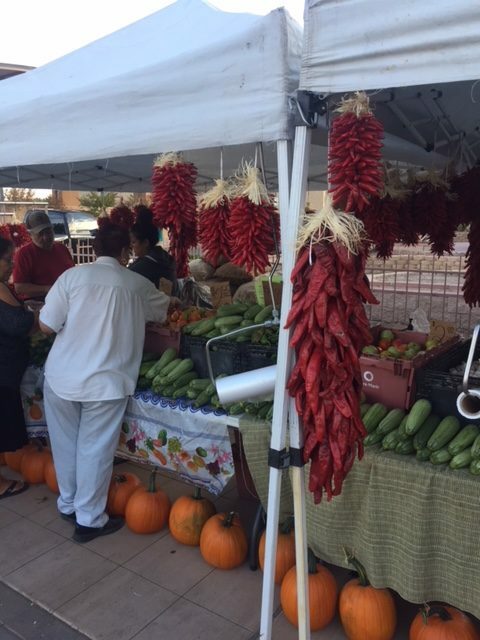 If you’re yearning for authenticity in the Southwest, all it takes is a 7-block stroll in Las Cruces at the Saturday Farmers Market to find it. It was the end of the green chile and tomato harvest and bins were filled with fresh produce from the Dona Ana Valley. Also found were pomegranates, Arkansas Black apples, jugs of horchata and limonata, locally farmed pecans and pistachios, and ristras (long strings) of red chiles hanging in front of many of the stalls. Yet, what really impressed me were the local artisans offering gemstone-laden jewelry, pottery, wooden crafts like adobe-style salt and pepper shaker holders, sculptures, watercolors of the local desert wildflowers, and photographs of the Organ Mountains splashed in red sunlight. All offered at a fraction of the cost one would find these wares 4 hours to the north in Santa Fe. On the way back to my car, I spoke to a jeweler who moved to Las Cruces 11 years ago after retiring as a broker in Montreal. “330 days of sunshine, no humidity, no traffic, this place is a hidden gem,” he told me. Once a major stopover on the San Antonio to San Diego Butterfield Stagecoach route, Mesilla is now a valued historic district in Las Cruces. Go there in the daytime under the hot desert sun and the dusty streets around the plaza feel exactly like it did in the 1850s when Billy the Kid stood trial for murder in the town’s courtroom. Today, many of the classic adobes from yesteryear still stand and are now home to gift shops, bars, and the some of the finest dining in New Mexico. 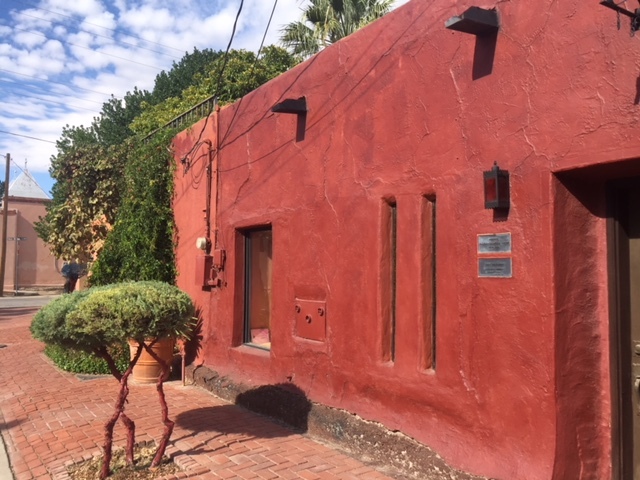 I loved the ambience and history of dining at La Posta de Mesilla while sipping a house margarita and soaking it all in. Tacos al pastor was the signature dish at nearby Andele, perfectly charred meat topped with homemade salsa from their salsa bar. Head south from Mesilla on Route 28 and you enter the Mesilla Valley, a short section of the historic El Camino Real route. At the end of the 16th-century, Spain created a 1500-mile route from Mexico City to Santa Fe that would bring settlers, horses, and goods to these lands. Old mission churches still remain, sharing the road with large tracts of pecan trees, orchards, and vineyards. Las Cruces has an ideal climate for vines with warm days, cool nights, and mild winters. Thanks to Franciscan monks, New Mexico started creating wine about 150 years before California. 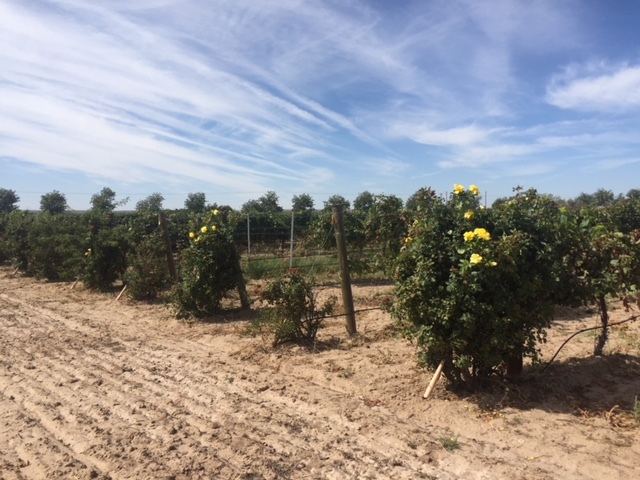 Today, New Mexico is home to over 60 wineries and ten of those wineries in the southern part of the state form the Mesilla Valley Wine Trail. My first stop was Rio Grande Vineyards, started in 2009, and now creating 15,000 bottles a year. We tried their signature wine, Queue Tendre, a semi-sweet white wine aged in Hungarian oak barrels, before moving on to my favorites, the dry red zinfandel and the sangiovese. Tastings are done in a classic ranch-style tasting room or outside on the back deck offering glorious views of the Organ Mountains. Back on Route 28, I passed over the Rio Grande River and under a tunnel of mature pecan trees, courtesy of Stahmann Farms, the world’s largest family owned pecan orchard. Not surprisingly, the shaded roadway is cherished by road bikers. Hikers need to visit both the White Sands and Organ Mountains National Monuments. 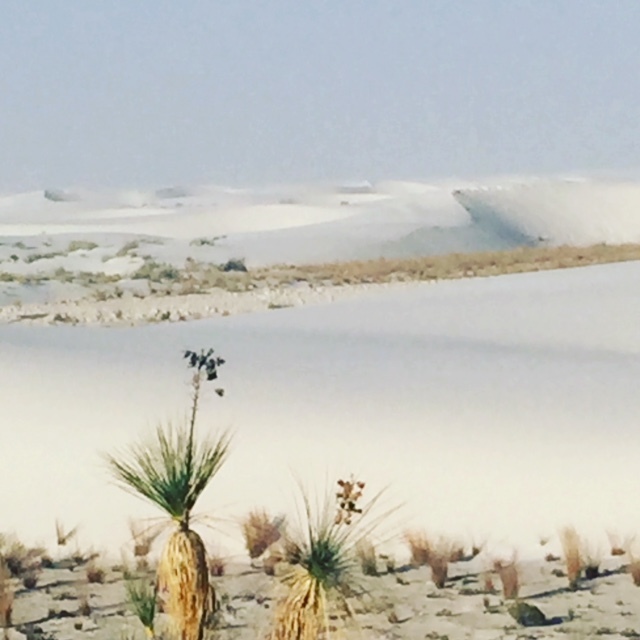 White Sands opens daily at 7 am and it’s best to get there early before the blinding white sand radiates under the hot midday desert sun. Smack dab in the middle of the Tularosa Basin, these wave-like dunes of gypsum sand span some 275 square miles and are truly a wonder to behold. Park at any number of lots along the road and simply walk atop the hard-packed grooved sand creating your own set of footprints. At first, you’ll pass a limited amount of growth like yucca plants and their distinctive, almost prehistoric-looking flower. As you stroll further in, you leave the scrub behind and all you see is an otherworldly terrain of rolling dunes. Locals like to bring their sleds to slide down the sand. Others will happily walk into this blanket of serenity for as long as necessary. 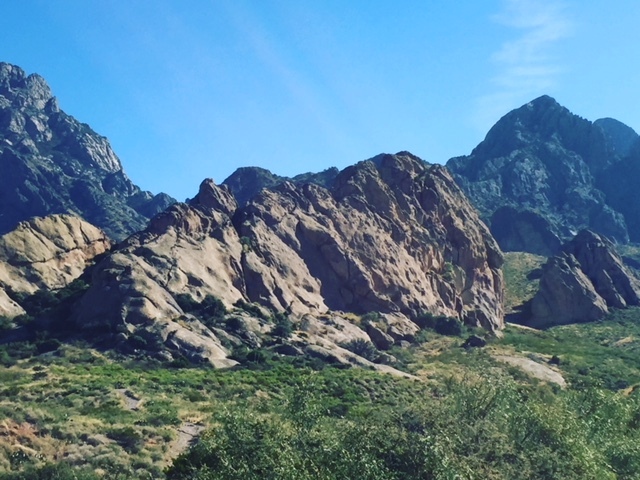 A great introduction to Organ Mountains is the 3-mile (round-trip) Bar Canyon trail that leads to the junction of two canyons, Bar and Soledad. We climbed a rocky path past numerous sotol plants—yucca-like with a large stem shooting out of the center almost as tall as a saguaro. A peaceful stillness enveloped us as we looked up at the jagged peaks. Soon we were inside a canyon passing prickly pear and cholla cacti. We stopped to see a waterfall trickle down the wall of rock next to level ground that was probably used for sacred ceremonies at one point in time. On our return trip, a red-tailed hawk flew overhead. It’s moments like these that will get me on a plane to El Paso to visit Las Cruces again. I just arrived and I am looking forward to starting a new job here in quaint Las Cruces. I want to discover all the hidden little shops and early history of this valley. Warm people and weather. Cannot wait to explore!